Whether you're cutting down a Christmas tree or buying an artificial tree from the store, it's important to keep safety in mind. 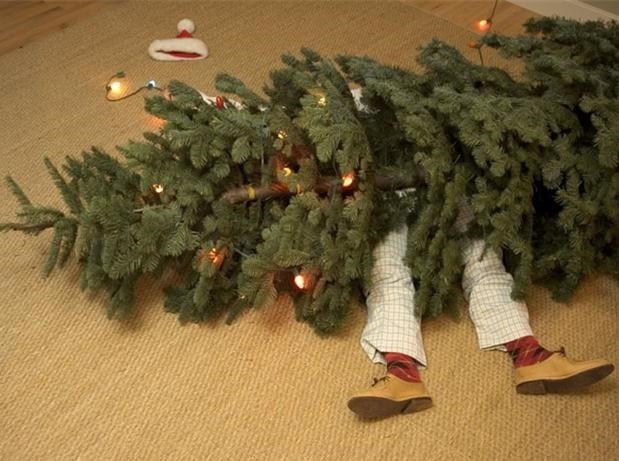 Here are 13 safety tips to be aware of while decorating your tree this year. Most importantly, don't burn the house down and don't let the tree fall on the cat. 1. Your tree should be green and moist with a resin-sticky trunk with pine needles that are difficult to pull from the branches. The needles shouldn’t break when bent. Needles shouldn’t abandon ship when branches are bounced. 2. Keep your tree away from fireplace and other heat sources. 3. Place the tree away from heavy traffic areas. 4. Buy only fire-resistant artificial trees. 5. Anchor the tree firmly to the stand. 6. Keep pets away from Christmas tree water, as it may contain toxic fertilizer. Stagnant tree water is also a breeding ground for bacteria. 7. Watch strings of lights—children can strangle on them and pets can chew them. Hang them high and hide or cover the cords near the ground. 8. If you have pets, consider forgoing the tinsel. If swallowed, it can become lodged in the intestines and cause obstructions. 9. If you have small children, consider using larger Styrofoam or plastic tree decorations. The glass kind can break and cause cuts, and the smaller ones can get stuck in the throat and cause choking. 10. Place your tree so it’s not visible from the street, which can be a message to would-be burglars. 11. Use timers for tree and window lights so they come on and turn off automatically, especially if you’re out of the house a lot during the holidays. 12. NEVER use lighted candles on the tree. 13. Use flame-resistant and non-combustible materials.